Pizza night can only get better if you’re making this homemade Brussels Sprout & Soppressata Pizza with Pickled Cherry Tomato Sauce! 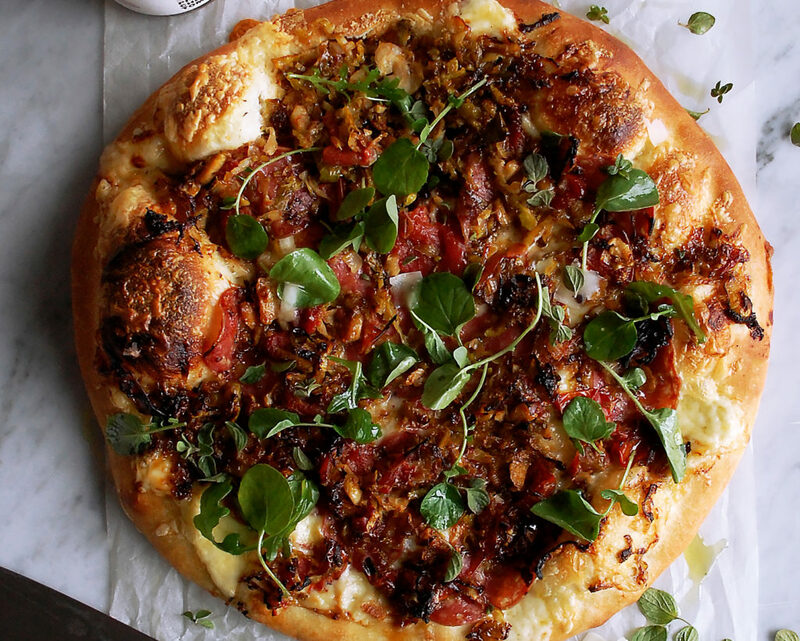 You can never really go wrong with a homemade pizza (see this burrata pizza with prosciutto & kale). But, this time I’ve got a special ingredient: pickled cherry tomatoes. 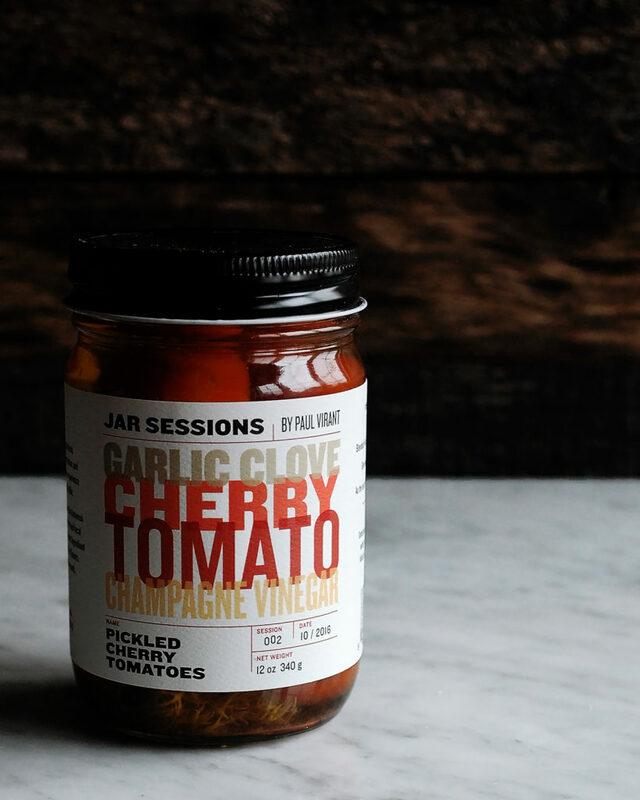 I’m so excited to kick off a fun series with Jar Sessions, a retail line of pickles and preserves by Chef Paul Virant. Paul has been celebrated for his preserving techniques for years. He even has an amazing cookbook out, called The Preservation Kitchen. If you’re new to preserving and canning, I highlight suggest it! It’s a beautiful compilation of knowledge and unique recipes. I use it all the time! But, if you don’t want to go through the work yourself, you can simply buy one of Paul’s jars and have one of his famous concoctions in your own kitchen. I actually interned for Paul a few years back at one of his restaurants, Vie, so it’s super exciting to bring a bit of his cooking into my own home! 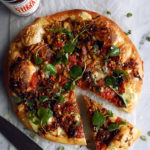 Today, I’m using his Pickled Cherry Tomatoes in this beautiful homemade pizza. I reduced the pickling liquid to made somewhat of a “sauce,” accompanied by the vibrant cherry tomatoes and caramelized brussels sprouts. 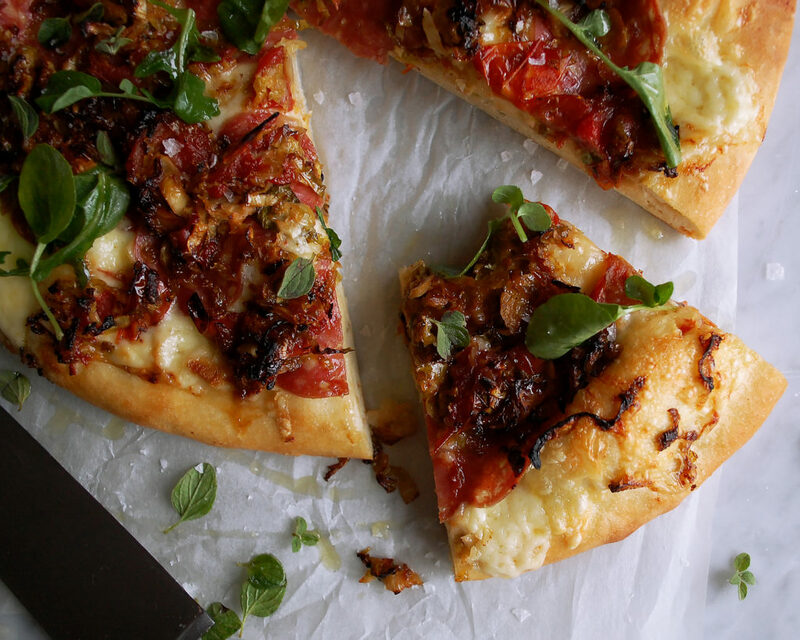 The rest of the pizza toppings are really simple, yet flavorful. Some freshly grated fontina cheese, thin slices of soppressata for a nice bite, and a drizzle of olive oil. The pickled cherry tomatoes add so much flavor, that I wanted to keep everything else nice and simple. I think you’re going to absolutely love this! You can buy all Paul’s jars online at Jar Sessions, or if you’re in the Chicago area, definitely stop by Vie for dinner and pick up a few jars there! 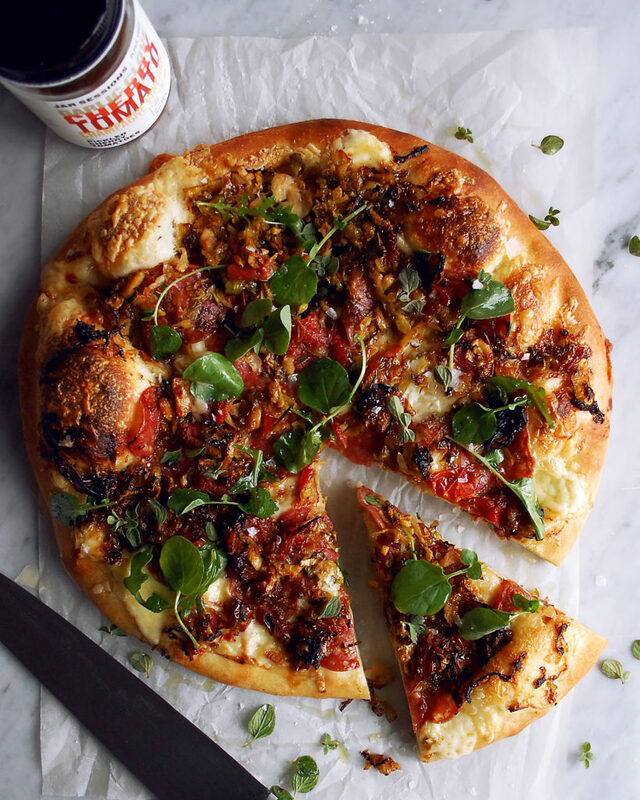 Then go and make this pizza…it is so good. And I think we all need it this Friday night! Transfer the dough to a clean, un-floured work surface. Knead for 2-3 minutes. Cover the dough with a damp towel and let rest for 1 hour at room temperature. Cut the dough in half and form each piece into a dough ball. Wrap the dough balls in plastic wrap and refrigerate for at least 4 hours or overnight. Remove the dough from the refrigerator and let sit at room temperature for about 30 minutes. Heat a large saute pan over medium heat. Add enough olive oil to coat the bottom of the pan. When the oil is hot, add the thinly sliced brussels sprouts. Let cook until tender and slightly caramelized, about 6 minutes. Season with salt to taste. Remove the pickled cherry tomatoes from the jar and quarter each tomato. Add them to the pan with the brussels sprouts and let cook for a minute or so. Strain the pickling liquid and measure out a half cup. Pour the liquid into the pan. Stir in the honey. Let the liquid come to a simmer and reduce, about 5 minutes. The liquid will create a simple “sauce” in the pan. Preheat the oven to 550F. Use your hands to stretch each ball of pizza dough on a floured surface into an even circle, roughly 10” each. Make sure the dough is level and that there are no tears. You also want to make sure the dough is slightly thicker on the edges for the crust. Once you’ve rolled out the dough, place two sheet pans in the oven, inverted, to preheat (or use pizza stones if you have them). 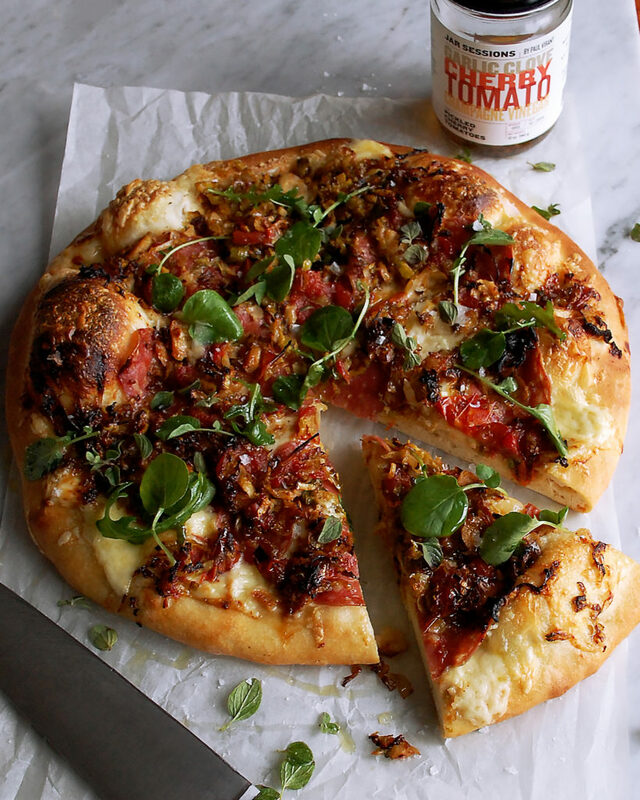 All toppings should be placed on the pizza in an even layer, leaving a ½” edge of dough for the crust. Start by distributing the fontina cheese evenly across each pizza. Place the slices of soppressata on next. Then, spoon the caramelized brussels sprouts and pickled cherry tomato sauce over top. Make sure all the spaces of each pizza are filled and the ingredients are evenly distributed. Drizzle olive oil around the edges of the crust. Use a lightly floured pizza peel to transfer the pizzas to the pre-heated, inverted sheet pans in the oven (or onto the pizza stones). Bake the pizzas for about 6-8 minutes, or until the crust is golden, the bottom of the pizza is firm, the cheese has fully melted, and the toppings are heated through. I like to give the sheet pans a turn half way through the cooking process. Transfer the pizzas from the sheet pan in the oven to a cutting board, using the pizza peel. Cut each pizza into 8 slices. Garnish with the watercress, fresh oregano leaves, a light drizzle of olive oil, and a pinch of flaky maldon salt.